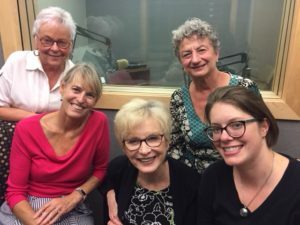 Guests: Lorraine Synder, Jean Mortenson, Nancy Carpenter, Attic Angel volunteers; Kristin Brey, Assistant Director of Strategic Collaboration, United Way…. Everybody loves a good bargain. What makes a good bargain even better is when the proceeds go to a worthy cause. For the second consecutive year, the Attic Angel Association Classic Clothing Sale on September 28-29 has designated the proceeds of their sale to go to mental health services for school-aged youth. On this program, Attic Angel volunteers Lorraine Synder, Jean Mortenson and Nancy Carpenter share the history of this annual event and describe what they mean by “great bargains.” On September 28 and 29, the Attic Angel Association office building at the corner of Old Sauk and Junction Roads, will be turned into a retail center filled with new and gently worn designer-label jackets, sports and cruise wear, suits, cocktail and formal gowns, coats, accessories and more – everything a woman could possibly want. Many clothing items have the original tags as they are donated from area boutiques including Chauette, Terese Zache, and Mainstream. Kristin Brey discusses the specific mental health issues that will be addressed using the proceeds from the sale – including the use of CBITS – the Cognitive Behavioral Intervention for Trauma in Schools. This program is designed to reduce symptoms of post-traumatic stress disorder, depression, and behavioral problems, and to improve functioning, grades and attendance, peer and parental support and coping skills for youth. For more information, go to atticangel.org.